GallowayTwpNews.com has reviewed the New Jersey Election Law Enforcement Commission (ELEC) Reports filed by the eight (8) council candidates. 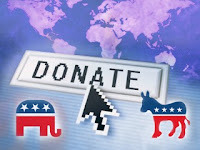 Of those candidates according to ELEC Website as of June 9, 2013, four (4) Republican candidates have not filed any Political Contribution Reports. Republican candidates Mayor Don Purdy, Frank Gargione, Robert Maldonado and Timothy Meadows Sr., according to NJ ELEC Website have not filed any political contribution reports. According to NJ ELEC, each Council candidate must file their reports according to the NJ ELEC guidelines, 29 days and 11 days before the election and 20 days after the Election. Each candidate can also file a 48-hour contribution notice within 48 hours prior to Election day. According to the Republicans "One Galloway" Facebook page, all four candidates held a Reception at Smithville Inn on May 23, 2013 at 6:00pm. According to their Facebook page photos, the event occurred and the donation amounts were $50/pp or $25/pp for GTRL Members. Co-hosts: $150/pp Host Committee: $300/pp. Approximately 50 people RSVP'd to attend. Indicating some sort of contribution towards their campaign. Democrat candidates Jim McElwee, Cliff Sudler, Bill Montag and Michael Suleiman have all filed their political contribution reports prior to Primary Election day. GallowayTwpNews.com has provided a list below of each candidates campaign committee and current contributions to campaigns as reported on NJ ELEC Website as of June 9, 2013. We will update the Republicans contributions once reports are filed with NJ ELEC. According to NJ ELEC Purdy shows a campaign balance of $1,043.96 as of December 14, 2009. Purdy has not reported any contributions for 2013. According to NJ ELEC, Gargione has not reported any campaign contributions as no reports prior to the deadline have been filed. According to NJ ELEC, Meadows Sr. has not received any campaign contributions as no reports prior to deadline have been filed. According to NJ ELEC, Maldonado has not received any campaign contributions as no reports prior to deadline have been filed. According to NJ ELEC, McElwee has received one contribution. May 9, 2013 - $300.00 from John Hess, CME Assoc. According to NJ ELEC, Sudler filed a campaign contribution report with no activity. Sudler serves as his own Chairperson and Treasurer. According to NJ ELEC, Suleiman has received four contributions. Suleiman serves as his own Treasurer. The candidates should receive a fine for not having their paperwork filed on time. Is it because its the Republican party that they thought they could go unnoticed? Can a resident call the State and complain? I know the tone of this article makes it appear as though the Galloway Republicans are doing something wrong but they're not. First, all required reports have been filled out and reported. There was a benefit on May 23rd. But financial reports do not have to be filled out until that money is actually deposited into the accounts. Given this benefit was less than 3 weeks ago, as soon as the money is deposited it will be reported. So, the Republicans are not trying to "get away" with anything, they are not trying to go unnoticed and all the required paperwork up until this time has been properly filled out. So you would be wasting your time filing a complaint. For clarification on the ELEC Law. The Campaign begins the moment a candidate "receives" funds, NOT when the funds are deposited. If that was the case, candidates could hold onto the check and/or cash for a long period of time. Secondly, the fundraiser in this case for the Republicans was held "prior" to the date the report was required to be submitted. Meaning, those contributions were required to be reported prior to the Primary Election day, in fact, a council candidate already agreed with my determination, including ELEC. Finally, the ELEC law is very defined and specific. To hold money past the Primary Election actually hurts the fundraising efforts for the candidates as now Pay to Play regulations will be scrutinized since only a specific amount can be contributed per election cycle (Primary & General) per candidate. Therefore, opinions are always accepted, however, don't mislead in defense of a candidate in an attempt to state fact when the information you may be stating is inaccurate. treasurer into the campaign depository. Reports have been filled out from what I have seen. Financial reports have not. But, just as it is stated that opinions should not mislead and be accurate, articles should not be written in an attempt to imply illegal activity is occurring or their actions are not legal and proper.